I also discovered the word carajay. Here's yet another cooking experiment, which gives me a grand total of THREE mostly plant-based dishes in my repertoire. First, a disclaimer: I am not a good cook. I think I cook with common sense and a little knowledge of chemistry absorbed by osmosis courtesy of the family. 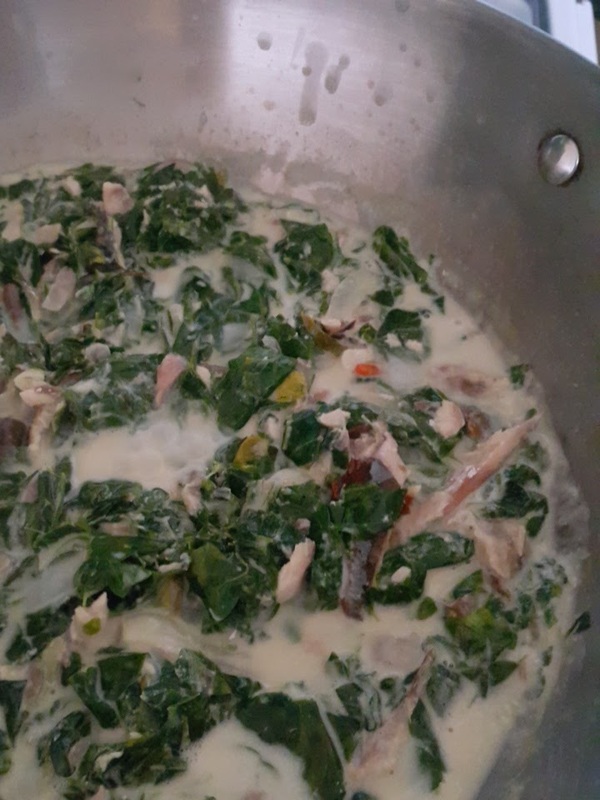 For the longest time, for me, there was only one way to cook moringa leaves or malunggay: we added it to tinola. In our household, we made a distinction between the two types of tinola we made depending on what leaves were used. The typical tinola with hot pepper leaves was tinola, while the tinola with malunggay was, well, malunggay. If I remember correctly, malunggay could also make do without the sayote or its alternative green papaya. I've always loved both types of tinola, especially during the rainy season. I never thought of any other way to eat moringa, except as tea and capsules specially marketed to breastfeeding mothers. In April this year, I went with Sherwil to Tabaco, Albay, to meet an old friend and be goddaughter to his child. He invited us to eat at his grandmother's house and we were treated to their family's home cooking. I discovered ginataang malunggay with tinapa flakes. 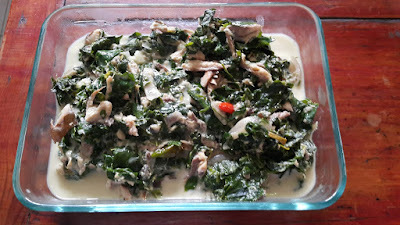 That's moringa leaves cooked in coconut cream topped with flakes of smoked fish. Now, I am a recent convert to gata or coconut milk. I used to hate it in everything and I couldn't understand why, for example, someone would ruin a perfectly good adobo by adding coconut milk to it. But one day, I tried some laing from this lechon pork belly place near my former office and I was instantly in love. So when we were headed to Albay, I was looking forward to getting some authentic laing. You can bet I tried to order it as much as I could whenever we ate out! That, and Bicol Express. I wasn't disappointed. Not at all. Then my sister asked me to bring home some pinangat, which I had never heard of. When I tasted it at home after bringing it in a makeshift cooler over our ten-hour bus ride back to Manila, my love for coconut milk was forever sealed. I added six chili peppers to spice things up, literally and figuratively. Today, a couple of months since I first tasted ginataang malunggay with tinapa flakes, I tried to make it from scratch. As I wrote in a previous entry, I've been working towards a more plant-based diet, and I've discovered that anything with coconut milk in it makes me crave meat less. In fact, the only time that I considered turning vegetarian was when I was eating meat-free laing. I bought gata from a neighborhood store (I guess I'm now their suki), then I plucked some leaves from our moringa tree, and then I flaked some smoked fish that's been waiting in the refrigerator. Then I followed this recipe and just added the smoked fish. It tasted so good, I ate more than I wanted to. But no matter! It's just leaves and some fish. It's healthy!